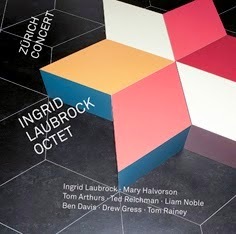 I have been thrilled by Ingrid Laubrock's musical development these past few years. The first Anti-House album really hooked me, and she's been experimenting and stretching and growing, and this new album is fantastic. Glad to hear you like it - it's certainly different than Anti-House but still has the qualities that makes her music so engaging. Agreed. Taken in whole, there is an emerging Laubrock sound world. Octet, Anti-House, and Paradoxical Frog in particular, seem to speak a common language.